The Sistine Chapel – or the Cappella Sistina – stands on the foundations of an older chapel called the Cappella Magna. In 1477, Pope Sixtus IV decided to rebuild the old chapel – and in so doing created today’s Sistine Chapel. In 1503 Pope Julius II decided to change the interior of the chapel and commanded Michelangelo to take it on. He initially disagreed because he considered himself a sculptor rather than a painter. But Michelangelo’s 4-year project eventually began in 1508. And what an undertaking it was. The plain exterior or the chapel gives little hint of the beauty that lies within. At Avventure Bellissime – the Italian tours and Italian holiday expert – we have the pleasure of taking our visitors to the Vatican City on a skip the line tour of the Sistine Chapel. Here, in this post, our tour expert Monica gives a hint on what you can see in the Sistine Chapel frescoes. It is a must see sight during your Italian vacation. We’d love to show you this in person, so if you are planning to visit Italy, please visit our website at tours-italy.com for more information. and Perugino to fresco the two long walls of the chapel. Even without Michelangelo’s work on the ceiling, the walls represent some of the best frescoes in Europe. One wall represents the story of Christ and the other the story of Moses. Along the central part of the ceiling fresco, you will see Michelangelo’s nine scenes of the Book of Genesis – the first book of the bible. The images are organised into three groups of three pictures. The scenes – Creation, Downfall and Fate - are not in chronological order and appear in reverse order when viewed from the entrance of the chapel. The scenes you will see from the altar to the main door on the ceiling of the Sistine Chapel frescoes include: The Separation of Light and Darkness; Creation of the Sun, Moon and Earth; The Separation of Land and Water; The Creation of Adam; The Creation of Eve; The Temptation and Expulsion; The Sacrifice of Noah; The Great Flood and The Drunkenness of Noah. The creation of Adam is undoubtedly the most famous fresco of the Sistine Chapel frescoes, and it is the most regularly reproduced. It is instantly recognisable with the two, strong muscular figures reaching toward one another in a dramatic pose. However, when surveying the frescoes you’ll notice that the sizes of the figures vary in size, and some are much smaller and far more detailed. One of the more detailed frescoes is ‘The Deluge’ which has four separate narratives but it is difficult to follow from the floor. It is said that in 1510, Michelangelo took a break from painting the ceiling and when he returned in 1511 he changed his tactic and spent the final year of the project painting images that were much larger and easier to view. 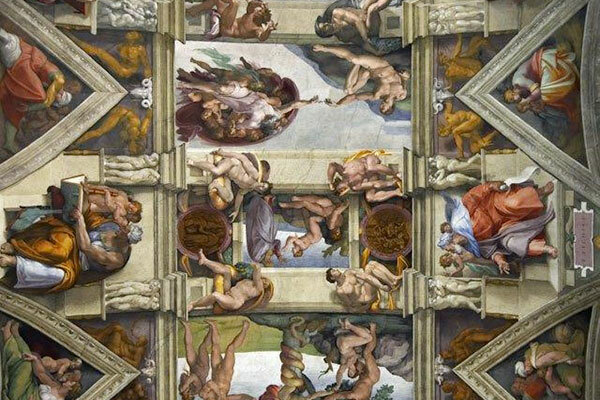 These are perhaps the images that are the ones that come to mind when visitors recall their tour of the Sistine Chapel – the Creation of Adam – that show less detail and focus on the main characters but on a much larger scale and also God separating darkness from light and the creation of heaven. God is seen here as a large powerful figure and you will see there is less detail here than the earlier images. Michelangelo returned in 1537 to paint a final Sistine Chapel fresco on the altar wall that took four years to complete. This depicts The Last Judgement – the second coming of Christ and the final judgement of humankind. It shows the souls of humans rising and descending to their fates – and Christ who is surrounded by well-known saints. Also, if you are looking for some travel inspiration, then check out our other blog posts. It’s a great read about all things about all things Italian and Italian holidays and includes ideas on what other sights to see when in Rome.